Our main food is rice, we use it for breakfast, lunch and dinner. On “fasting days”, we eat rice only once in a day. Other meals, we eat something that is made of wheat or other lentils/floors. I make these dosas on such days. Moong dal is beleived to be cold on the digestive system and the body. It is rich in proteins. Ginger and green chillies give a very nice flavor to dosas. Since these do not require fermentation, a lot of planning is not required. These are similar to pesarattu and adai, but slightly different. Soak urad dal and moong dal in water for about 2hrs. Grind them along with ginger, green chillies and salt to a smooth batter (of dosa batter consistency). Instead of grinding ginger and green chillies to the batter, they can also be mixed to the ground batter. Heat tava and make thin dosas. Cook them from both sides like any other dosas. PS: 1 cup of red masoor dal can also be added to the dosas along with moong and urad dal. Yummy I make these a lot for a quick lunch dish.Nice click. You posted a dosa after a long time. Thanks! i love dosas, this is very healthy with lentils !!! both are split dal right? split white color urad and split yellow moong? this will be really handy. Do you soak both the dals together and grind or separately like dal and rice. Seems fantastically easy & simple to make & looks delicious! Will definately try it out! thanks Shilpa! Now that is another dosa I saved from your collection … u are so awesome with dosas…. U know & try them all differently…. I loved it… & saved it too… I would wanna try & have them…. toooooooo..
Just tried it out, and its all it promised to be. Going to be a regular contender for sunday breakfast now. I think amma used to make a similar tasting idli, must ask her. Thanks! Looks so delicious with the beautiful color. Very nice! Please give it a try. I normally don’t keep dosas for long. I think if you make them a bit thick, they will remain soft. 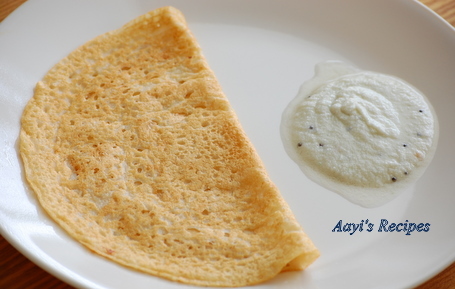 Yes this dosa stays soft and can be taken by kids for lunch. As Shipa suggested, make it thick, not thin as thin dosas become crisp. I give this dosa with a box of flavored yogurt to my son. Can I make these as a base for a pizza? Also just curious you did not boil the moon and urid daals, right? You just soak them and then grind them? It will be too thin for a pizza base. No boiling of dals. How much water do you soak the lentils in? Sorry, this is my first time making dosas..
Add enough water to cover the lentils. The water level should be 2 inches above the lentils. Thanks for the recipe. Can do tell how long can we keep this batter either outside or in fridge? Can we use the same batter for making idlis if kept overnight?